Here you can see the instruments, where they are situated, learn their history and the events insolving them. Also provided is information about " The Association of Organs Friends of Montpon-Ménestérol-Montignac " i.e. 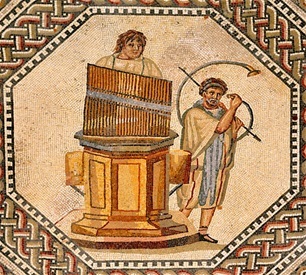 visits (individuals or for groups) to the instruments, yearly concerts and other events shoving this unique heritage to advantage. The town of Montpon-Ménestérol is situated in the Dordogne; She is divided into two parts by the river L'Isle, Montpon on the south bank and Ménestérol on the north. These two communes including the villages of Montignac and Vauclaire were joined together in the year 1964. Therefore the town includes two churches, one in Montpon, the other in Ménestérol plus two chapels, one in the ancient Carthusian Monastery of Vauclaire and the other smaller one in Montignac. The church of Montpon built in the 19th century was equiped with a rather small organ in 1842 (1 keyboard and 7 stops). In the 1960's, on the initiative of Francis Chapelet (an international organist ), the organ was reshaped and above all extende so that it could fulfill it role as much for the liturgy as for concerts. Again thanks to Francis Chapelet's perseverance and energy, the church of Ménestérol which was very little used for services, became the center of the "Spiritual Concert Association" born concurrently with the extension of organ of Montpon. 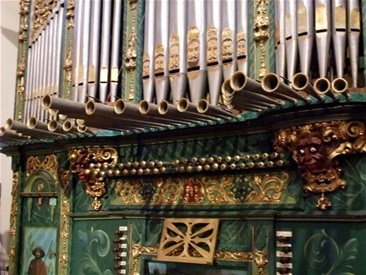 The church was equipped with an organ in 1980, an instrument partly savaged from St. Matthew's Temple in Colmar. Moreover Francis Chapelet on his family estate was having an auditorium built where he had three instruments set up, the styles of which were very different from the other organ's in the churches. In his house he keept the studying organ which he had bult while he was studying at the Paris CNSM. 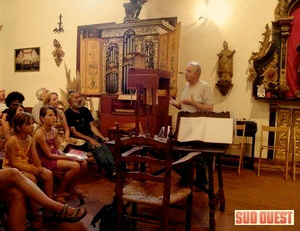 In december 2009, a second Italian organ enriched his collection at his own house, and in march 2010, the small Montignac Chapel got a neworgan made by the organ-builder Didier Chanon. Francis is expecting to see an other organ , in the loft of Vauclaire Old Monastery Chapel, to complete the colection ! Thus the town of Montpon-Menesterol was referred to as " La Capitale de l'Orgue en Aquitaine " for no other town could avail itself of such a collection of organs. As far 1954, Francis Chapelet and his father (an official Painter of French Navy) founded the "Association " with some other persons to make the local population aware of the necessary restoration of the small organ of Montpon. For this purpose, they organized various events and concerts with choirs, orchestral ensembles etc. As soon as several organs were implanted in the locality, they organized training courses for organists. Ever since, the Association has continuated programming several concerts each year in Ménestérol during the summer. Its members have tried to promote some young artists, organists as well as other instrumentalists or choirs. Some members being organists themselves permit all these organs to be visisted on Thursday afternoons in July and August, annualy (free entrance). Anyone who plays the organ even a litte is invited to try these organs. On the heritage day all these instruments can be seen and played by the visitors. All the instruments are accessible. One only has introduce oneself, a day in advance, and ask the keys to Francis Chapelet or M. Christian Janot. An Auditorium visit. Richard GROSS (member of the Association) commenting upon the organs.